Nutshell: I’d give American Sniper an A-. Is there a bit of hero worship? Sure. But Cooper’s performance and Eastwood’s whipsmart direction keep things grounded. Some of the most believable scenes of wartime devastation, thanks to Eastwood’s immersive style. Gotta admit before the news about this film hit my inbox, I’d never heard of Chris Kyle. But if a flesh-n-blood man was ever meant for a Hollywood big screen biopic, he’d have to be right up at the top of the list. A Navy SEAL that fought in Iraq, and called the “most lethal sniper in US Military History”, Kyle signed up for the SEALS after 9/11, fought in the Iraq war, and then came home and helped war veterans suffering from PTSD. American Sniper shows his life before, during and after his tours in Iraq, and the film is riveting. 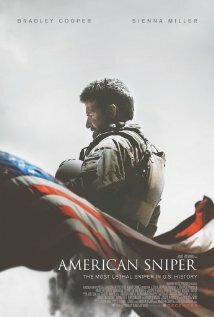 What really stands out in Sniper is Eastwood’s ability to get viewers deep into the action. Camera angles, sets and production design gave me a “boots on the ground” feeling whenever Kyle’s wartime exploits were shown. I could almost taste the grit of a sandstorm, and feel the terror coming off the soldiers. I also felt heartbroken over what Iraq has been reduced to; a rubble-strewn horror where blood, sand and naked rebar are all you can see. Where a family that tries to stand up to terror can only expect the very worst, and even then it’s more horrible than you can imagine. Eastwood’s unblinking eye shows filmgoers the heartbreaking terror of daily lives along with what it must have been like to be a soldier in that war torn area. As Kyle, Bradley Cooper is nice mix of good-ol-boy and military respect and full-on SEAL bulk; he gives Kyle an intelligence and internal dynamic that rises above caricature or mimicry. (Plus, the scene where he’s deadlifting enough iron to lay train tracks for a small country is pretty damn impressive.) The same can be said of the actors playing members of his SEAL team. Though they’re in and out of scenes, Jason Hall’s script gives these characters just enough exposition to let you feel for them, and the actors (especially Jake McDorman as “Biggles” and Kyle Gallner as “Goat-Winston”) bring ‘em to life easily. My only quibble? Sienna Miller as Chris’ wife Taya Kyle, shows the pain of waiting for her husband Stateside, but is given little to do but cry for him and bemoan her situation. It’s not as horrible as that suggests, but it’s still too cliche for the rest of this film. Eastwood crafted the hell out of this picture, and yet it feels effortless. I’m betting one of the reasons this film isn’t getting as much awards season love is because Eastwood makes it seem so damn easy. While January is known as the dumping ground for lost films, it’s also a time where high-quality stuff that came out in limited release the months prior (For Your Consideration) finally get a wide opening. American Sniper is one of those January films worth your time. This entry was posted in Movie Reviews and tagged American Sniper, Award Season. Bookmark the permalink.